Our next route begins with Sololaki region. It is one of the most ecologically clean parts of the city. This district begins from Freedom square and ends at the mount Mtatsminda. According to the story the Arabs built a canal in this area to water the gardens. Canal in Arabian language is "sululakh" and since that period the place is called Sololaki. While going along Sololaki street you can understand why Tbilisi has been called "Caucasian Paris" - it is thanks to this special atmosphere of peace, language mix, cosmopolitan architecture of the 19-20th centuries. Tbilisi houses of that period by their splendour and quality co-uld be compared with patterns of Euro-pean "modern": ambitious owners ordered the construction of their mansions to the best architects of the city. By the end of the 19th century Sololaki had become a prestigious district, built by bourgeoisie with fashionable residences and profitable houses in "modern" style. It is worth mentioning that today's Sololaki looks like exactly as it did in those remote times and on some doorways decorated with marble crumbles, one can read the Latin writing SALVE ("Welcome") or surnames of the former owners. Some old people do remember the names of the clerks, major manufacturers, bankers and merchants, whom these wonderful hou-ses belonged to. During this walk we'd like to acquaint you with the best patters of Tbilisi architecture of 19-20th centuries in "modern" style and other ones. In these streets you can prove yourself that you see a "piece" of old Tbi-lisi and understand that "the old" when spe-aking about Tbilisi is referred first of all to the style, to its recurrence in spite of all fu-rther reconstructions and alterations. The-se houses contain more information about Tbilisi than any book on history. From Freedom Square you can go up along Leonidze street where on its right, at the distance of 20-30 meters you can see the building of the National Bank of Georgia - the former Mutual Credit Society. The buil-ding was erected in 1913 (architect M.Oga-janov). Abbreviated names of the organi-zation - the first owners of that credit de-partment has been preserved - T.O.B.K.- (Tbi-lisi Mutual Credit Society). When Soviet po-wer was established the building was con-fiscated and given to the State Bank. In 1991 after the collapse of the Soviet Union it was partly damaged and then restored. At first it was a two-storey building, in 1959-1960 a third storey was added to it. Its main facade facing the street is in "mo-dern" style. The facade is decorated with relief ornament and figure compositions. One can see two figures of naked athletes as if rising from the wall surface and over the arc there is a picture alto-relievo of a man.. If you are fond of numismatics, the most curious thing you can find there is the Mo-ney Museum, housed in the bank. The mu-seum was established in 2001. The muse-um's exposition bears in a chronological order a many-century history of money in-dustry and money circulation in Georgia since the 4th century B.C. as well as mo-ney from foreign countries: Kolkhuri tetri, Macedonian starter, antique coins, Ara-bian drachmas, Venetian ducats…Here you can buy copies of old Georgian money, mo-dern Georgian investment, jubilee and col-lection money. A famous Russian poet Nikolay Gumilev lived in Machabeli street (the first left turn on Leonidze street), (1900-1903) in the house of an engineer Mirzoev (at the cor-ner of Leonidze and Machabeli streets). It is an angular building and it faces two pic-turesque green streets. In Tbilisi Gumilev saw his first poem published and here he wrote his poem for the album "of a beauti-ful dame". Our next stop is a wonderful building of the Georgian Writers' Union in Machabeli street, which is the monument of the town architecture of the 20th century. The buil-ding was erected in 1905 (architect K. Tsa-ar) by David Sarajishvili (1848 - 1911), a fa-mous Georgian patron of arts, an enter-priser, the founder of cognac production not only in the Caucasus but in the entire Russian empire, a doctor of philosophy and chemistry. The architecture style of the building is clearly expressed "modern". All his capital together with this building Sarajishvili bequeathed to the Georgian public, church, engineers, technicians and workers of his cognac factory. 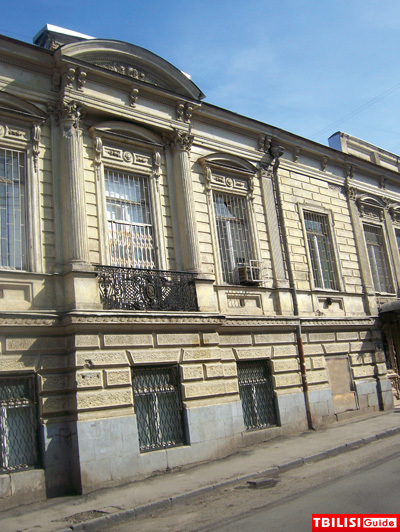 After the death of Sarajisvili his wife's brother broke his will and in 1918 decided to sell this building at the auction in Sergiev street. This fact infuriated the Georgian public and it addressed to a Georgian busines-sman famous for his charity activities Aka-ki Khoshtaria, who purchased the buil-ding. In 1921 when Bolsheviks came to po-wer, Khoshtaria left Georgia and gave this building as a gift to Georgian writers. La-ter, when the independence of Georgia was proclaimed, the building was given to the Writers' Union. In 1928 M. Gorki lived on the second floor of the building. In 1927 Vladimir Maiakovski read his poems to young Georgian writers there. On the 8th of October in 1927 a progressive French writer, publicist and statesman Henri Bar-busse was solemnly met there. On the 10th of June in 1938 a prominent Russian wri-ter Alexey Tolstoy gave a speech in this building. Lermontov street is at Machabeli cross-roads in parallel with Leonidze street. At the beginning of the street there was a house of the general-major Fedor Akhve-rdov in the 19th century. In 1816 he came from Saint-Petersburg to the Caucasus ha-ving been appointed as a commander of Caucasian artillery corps. He settled with his family in Lermontov street in Tbilisi. The hostess of the house, Praskovia Arsenieva, who was Lermontov's second aunt, cre-ated a saloon which played a great role in the cultural life of then Tbilisi as this hou-se became the center of the high society and literal life of the town. Kyuxelbeker, Pushkin, exiled Decembrists Iskritski, Iakubovich, Rinkevich and others visited it. In 1837 during his first exile a great Russian poet M. Lermontov lived in Akhver-dovs' house. The prince Alexander Chav-chavadze's family lodged its outhouse. 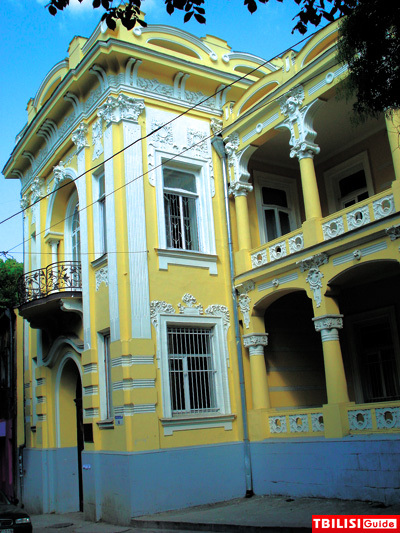 Cha-vchavadze's house was famous for its hospitality all over Tbilisi. The heart of the hospitable house were women - his wife Salome and two beautiful daughters - Nina and Ekaterina. According to their contemporaries, Chavchavadze's house was a link between Russian and Geor-gian intelligentsia. Lermontov often visited Chavchavadze's family and talked to a widow Nina Chavchavadze in 1829. According to the legend, she presented Ler-montov the daggers from her husband and father's collection in remembrance when they parted. And Lermontov wrote his poem "Dagger" dedicated to this event. The families of Akhverdov and Chav-chavadze had kin's and friendly connec-tions. Their children were brought up together. Alexander Griboedov met Nina Chavchavadze in the family of Akhverdov and they fell in love with each other. Here he proposed to her. 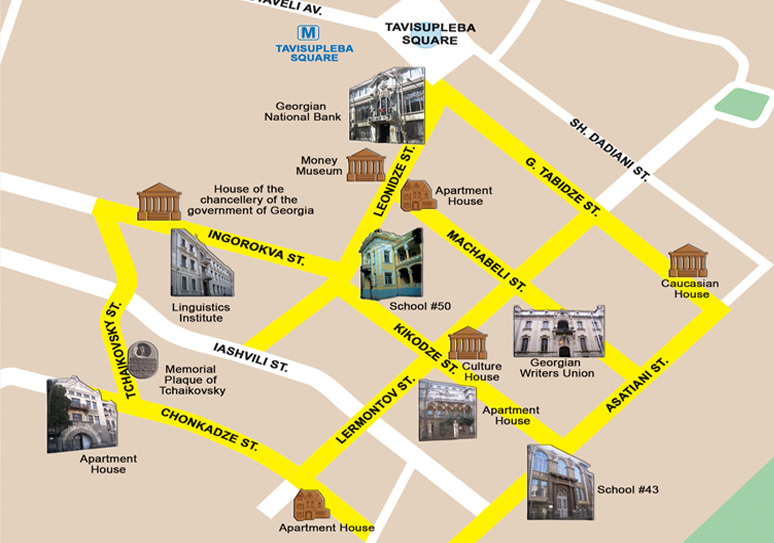 Going further along Machabeli street we find ourselves in Asatiani street. In the 19th century the princes Bebutovs' palace was located there. From here originates the former name of the street - Bebutov, before that it was called Sadovaia. 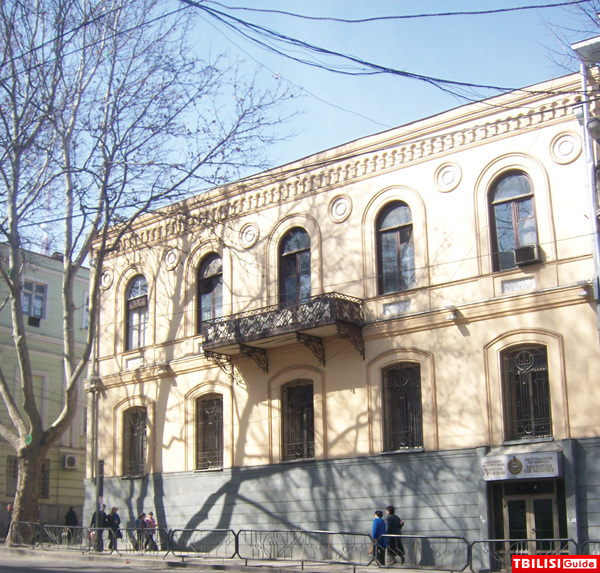 At Asatiani 50 there is a famous public school #43, the former Mantashev trading school. It was built in 1910-1911 (architect Gazaros Sarkisian), its building was sponsored by a famous oil businessman Ale-xander Mantashev. The school was ope-ned on the 1st of July in 1911. 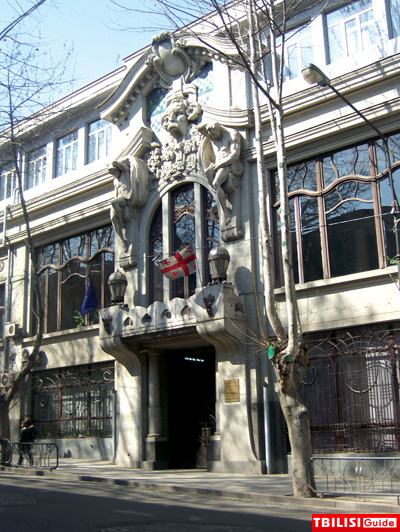 It is written on its copper plate: "This trading school was opened on the 1st of July in 1911 by Tiflis Merchants' Partnership during the ruling of his Majesty duke Vorontsov-Da-shkov and with the money of the honored guardian of the school - Mantashev". Un-fortunately, this plate was knocked toget-her from the school's facade. The school was well equipped with studies, workshops, a sports hall. In 1913 Nicholas II of Russia visited the school. Until 1922 there was a bust to its founder and guardian in the ve-stibule and a service for the dead was an-nually arranged on the day of his death. At different times the pupils of the school were astrophysicist Victor Ambartsumian, a great American film-producer Rouben Mamoulian, a tennis-player Alexander Metreveli. A composer Michael Tariverdiev fi-nished this school too. His first recognized composition was his hymn to the school, which is still remembered and sung by its school-leavers for so many years. Not far from the school, if we turn to the left, we find ourselves in Kikodze street. Lermontov street crosses it on the halfway. Kikodze 8 - the former Mantashev's house. According to the legend, Mantashev built this house for his daughter - on its balconies one can still see a woman' silhouette. At Soviet times there was the Arts Workers House. Descending Kikodze street we can reach solid yellow building. Now there is school # 50, but at the beginning of the 20th cen-tury, in 1918-1921 the French Embassy functioned in this school, and the first co-nsul in Georgia was a wellknown French traveler, a businessman Jack-Fransua Ga-mba. He traveled round the Caucasus twi-ce and then published a detailed description of his travels in Paris. It was he who insisted on establishing the French Embassy in Tbilisi - he was patronized by Russian authorities. Gamba was in friendly relations with Alexander Chavchavadze (1786 - 1846) and stayed at the prince's house in Tsinandali. When we get to the end of Kikodze street, we again find ourselves in Leonidze street. While crossing the street we get Ingo-rokva street (former street of Peter the Gre-at, at Soviet times - Dzerzhinski street). The first thing you can see in this street is the house of the Chancellery of the Government of Georgia, the former central committee of the Communist party of Georgia. Just opposite it there is the Linguistics Institute named after Arnold Chikobava (In-gorokva 8). Before the Soviet power there was a governor-general's office in this building. From this office you can see Tchaikovsky street. At the house (Tchaikovsky 12) of M. Tchaikovsky stayed his brother, a great Russian composer Petr Tchaikovsky. The composer stayed annually (1886-1890) during a month at his brother's house in Tbilisi, who was a prosecutor of the District Court and then - a vice-governor. Petr Ilich repeatedly recalled with delight about these periods of his life in his letters and dairies. Going up to the end of Tchaikovsky street, we set against Mtatsminda and turn to the right, Chonkadze street. Now we stand in front of a magnificent building (Chonkadze st. 12 is on the left side of the street). 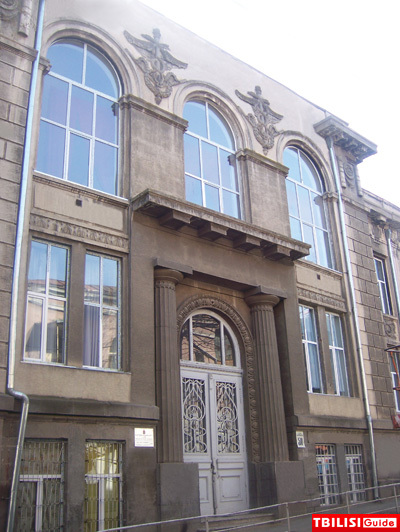 It is Bozarjanz house, a tobacco manufac-turer (the beginning of the 20th century, architect Ogajanov). This house is one of the most interesting of the examples of the style "modern". Its foyer is decorated with tiles. The architecture of the house is in one style, which makes it especially interesting. The house is surrounded with the arc, laid with large light gray stone, with the overhung balcony with carved balustrade above. This threestorey mansion of Bozarjanz brothers received a special architectural award at the contest, organized by Tbilisi mayor authorities in 1915 for the best facade. People still call it "the ho-use of Madam Bozarjanz ". Why "Madam"? Because rich businessmen in order to pre-vent themselves from bankruptcy and other financial misfortunes rewrote their realty to the names of their wives and family folks - for a rainy day. When Bolsheviks came to power, this trick did not work. The mansion was requisitioned, though two rooms were left to Madam. New lodgers appeared in this house - among them was Lavrenti Beria. By the way, it is in this house, where scenes of many films were taken, among them "Data Tutashkhia". Our last stop is in 20 G.Tabidze street (be-hind 5 Chonkadze street we turn to the left to 5 Lermontov street and then turn to the right and go up the street) - "Caucasian Ho-use" or as people call it "Pushkin Memorial of the Smirnovs' House". When entering the house one unwillingly forgets that in mi-nutes' walk distance there is the center of the city because all of a sudden one becomes a witness and a participant of a wonderful serenity, the calmness of the 19th century. It was built in 1860 by order of the head of the Tamamshev family (a rich Ar-menian merchant) and according to the de-sign of a Swedish architect Otto Simenson in a traditional European style with colored wooden balconies. Elizaveta, Tamamshev's daughter, married Michael Smirnov and got this house as her dowry. Alexandra Osipovna SmirnovRosset was Michael's mother. She was a friend of Pushkin and Krilov, Mitskevich, Leist and Zhukovski, a maid of honor of the two empresses, a hostess of the literary saloon, one of the most beautiful women of that time. At the end of the 70s of the 19th century Michael brought the furniture from his mother's Petersburg saloon into this house and soon it became one of the centers of cultural communication where remarkable people of Georgia and Russia, writers, scientists, actors, musicians, met and conversed. In this way many unique exhibits appeared in Tbilisi: decorative tables, made by Peter the Great himself, Pushkin's gentleman of the monarch' hat, tobaccocase of Katherine II and many other things. 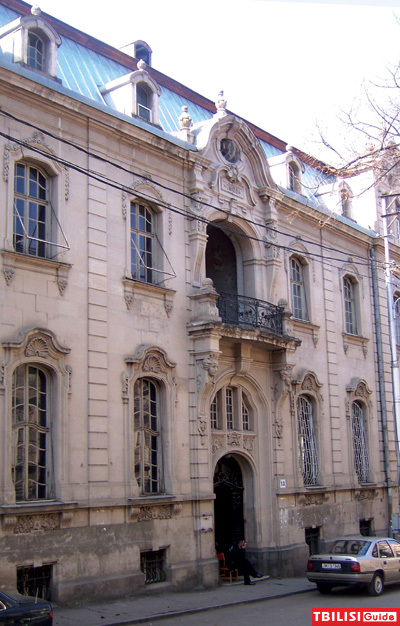 Ilia Chavchavadze, Niko Nikoladze, P. Melikishvili, A.Rubinstein (who often came to play on tour in Tiflis and spent a lot of evenings with pleasure in this house), P. Tchaikovsky visited this house in order to touch the family relics. It is in this house where the first academic edition of Nikoloz Baratashvili (1817-1845) works was prepared and published (Elisabeth's sister married the nephew of the great poet). Three generations of Smirnov's family managed to carefully keep and bring through the 20th century cataclysms this unique collection to us. The family collection of the Smirnovs was gifted to Georgia in 1985. Here we end our walk round Sololaki. We might as well wander along its peculiar stre-ets and side-streets for a long time. A sign of Time is somewhat subtle, intangible, shadowy. But it is immortal and flesh, stone, brick are transient. Loyalty to the past is first of all the ability to coexist with the "world of shadows" and to keep faithfulness to a definite style in new circumstances. For the city as a vital system this sign of the past is the feeling of "a small secret" - the-se sensations are left after the sightseeing of Sololaki.